Agents of the New Order routinely demonstrate the ability to retain incredible amounts of knowledge. From a miner's perspective, it almost seems as if our Agents know it all. Yet our Agents conduct a surprising amount of their business purely by instinct. 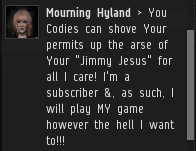 Agent Alt 00 had a feeling about Mourning Hyland. She could tell that Mourning was a non-compliant; she was AFK mining and lacked a permit. Our Agent's finely honed instincts told her that if she killed Mourning, the miner might be saved from bot-aspirancy. So far, Alt 00's instincts were proving to be deadly accurate. She executed a perfect solo gank. 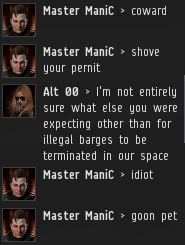 As elite as this act of elite PvP was, Alt 00 knew it was only the beginning. Our Agents are unafraid to trumpet their own victories in local. Self-promotion is, in this case, actually an act of supreme modesty, because Agents' victories really belong to the Code. Master wasted no time in parroting the typical pro-carebear drivel. Why had he reacted so badly to the gank of Mourning Hyland's Retriever? You'd think he was Mourning's alt, but no. There was another explanation. 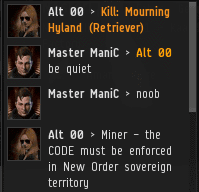 Alt 00 had come to rescue Mourning Hyland. She still intended to. 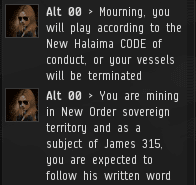 But a side effect of AFK mining is that our Agents sometimes have to wait a while before a miner returns to their keyboard to learn their lesson. Master ManiC was, in essence, a warm-up act. Often a lesser-known band or a comedian will take the stage before the main event of a concert begins. Angry outbursts from random players in local serve the same function. Alt 00 dealt with Master ManiC as she eagerly awaited the return of Mourning Hyland. The system was thick with anticipation. Would Mourning behave like a Goofus or a Gallant? Would she offer a "gf" in local? An apology? Or would she take Master ManiC's cue? 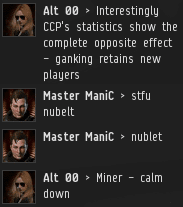 Gankers mark time through killmails. 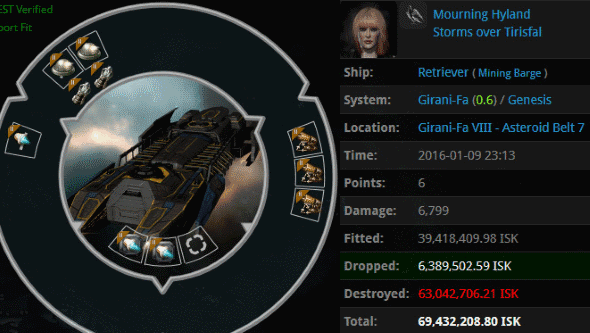 Alt 00's criminal timer ran down, and she ganked again. It was over 20 minutes since the death of Mourning's Retriever. There was still no sign of her. At last, the moment had arrived! Alt 00 could hardly contain her excitement. She quickly went to work deconstructing Mourning's misconceptions about the game. 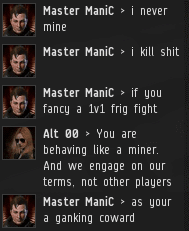 Highsec isn't a place where you can do whatever you want; it's a place where you can do whatever I want. 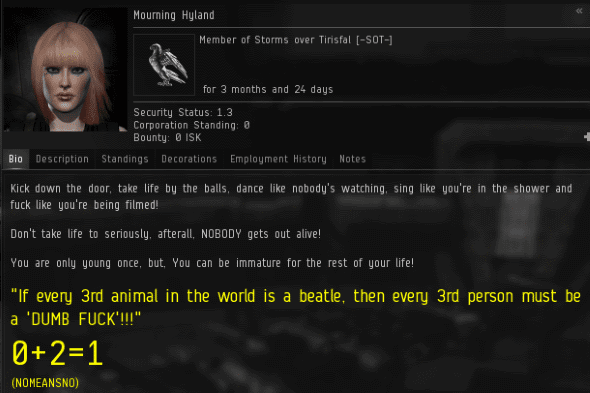 No wonder highsec is the most popular area of EVE. Mourning Hyland was a real firecracker. She vowed never to submit to the New Order. Strong words, but Alt 00 was an Agent of the New Order. There was no challenge she wasn't prepared to face. "I was given a permit, but choose not to display it! Hah! Miners always start out with flimsily transparent lies, which is one of the reasons we can always see who are miners and who aren't. How funny, you're starting to get tired. There are like three posts I've made that you've missed. Go back and fix them. 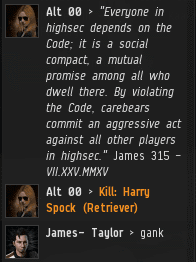 Hi-Sec is s place where you can do whatever I want. More solid gold from our fearless savour. I have read that bio five times. This is foxbolt sneaking back in right? It HAS to be. 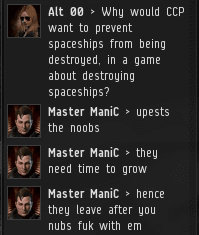 Well, it should be underlined that Master ManiC is part of a wardec corp that specializes in griefing noob highsec corps. So his posture is quite hypocritical. CODE is way above this bottom feeder.